Learning how to grout tile with Spectralock epoxy is a godsend. Epoxy grout can be very intimidating. Epoxy grout is the best! Not only does in make your shower bulletproof, it also provides the lowest maintenance possible for a grout. 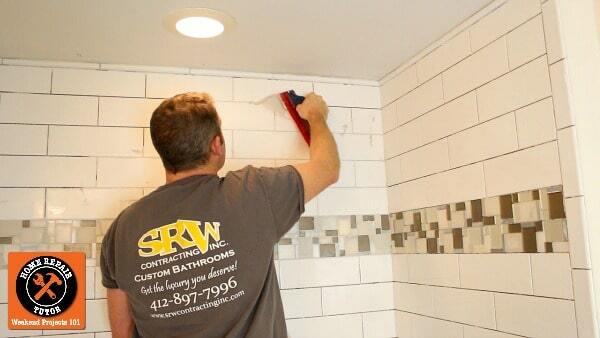 Today we’re sharing quick tips on how to grout tile with Spectralock epoxy grout. It’s easier than you think. There are a ton of different grouts. But the best one for color consistency and maintenance is epoxy. Our Bathroom Repair Tutor member Nicoli used Spectralock and got awesome results. She recommended we give it a shot. So we did on a subway tile shower. We were impressed. Epoxy can be intimidating because it can be painful to remove from tile. The biggest fear is the epoxy grout setting up quick and creating a cleanup disaster. Normal grout is hard enough to remove from tile, and epoxy is near impossible. However, Spectralock is super user friendly. We didn’t have any issues with it setting up too quickly. Buy the Spectralock mini kit which has Part A & B and choose a Part C, which is the color additive. Mini kits are awesome because they don’t take long to use. Get all the tools needed in one spot, e.g. white scrubby pads, mixer, gloves, float, sponge, water, utility knife, etc. Dampen the tile with a sponge and immediately pack the joints with Spectralock. I forgot to mention this in the video, but dampening the tile allows Spectralock to glide over the surface. Remove excess grout by scraping the float at a 45 to 90 degree angle to the tile. And keep corners free of grout, they’ll need a silicone caulk joint for expansion and contraction. Latisil is the color matching silicone for Spectralock. Spectralock is a great epoxy grout, and we recommend it even for beginners. Permacolor Select grout is also another viable grout option instead of Spectralock. We posted the full Spectralock video tutorials over on Bathroom Repair Tutor. We used it for both the shower floor and shower walls – plus have tips on how to seal tile so the grout won’t ruin it. If you want your grout white do you need to add color product? If you are saying that you can’t use exposy grout for joints? Then, what should you use for the joints?